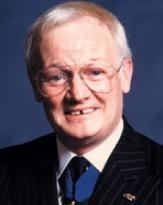 John Inman was just thirteen when he first appeared at the South Pier in Blackpool, his home town. Since then he never looked back, with innumerable appearances on television, in cabaret and stage productions all over Britain and overseas and with starring roles in London's West End. His West End debut came in the musical 'Ann Veronica' at the Cambridge Theatre, followed by seventeen months at the famous Windmill Theate after which John starred as Lord Fancourt Babberley in the production of 'Charley's Aunt' at the Adelphi Theatre in the Strand. However, it was as Mr Humphries in the long running BBC series 'Are You Being Served?' that he became a household name throughout the country and world-wide. He was chosen to be the subject of 'This Is Your Life' and was later honoured by the Variety Club of Great Britain as BBC television personality of the year. He was also voted funniest man by the readers of the TV Times. Summer seasons were also an important element in John's varied career. His favourite show was pantomime, of which he did over 40, and he was recognised as one of the best Dames in the business. He appeared in six Royal Variety Performances, before most of the members of the Royal Family. In spite of his world tours, he still returned home each Christmas for his pantomime appearances. 'Are You Being Served?' was shown on American television from coast to coast with huge success, which made John a truly international star. John worked unceasingly for charity. He was elected King Rat of the Grand Order of Water Rats in 1993 and in 2002 President of the Heritage Foundation. In December 2005 he entered into a civil partnership with his companion of 35 years, Ron Lynch.